With the European Union Trademark you are able to obtain trademark registration 27 countries at once. Our trademark attorneys will gladly help you with any questions you might have about registering an EU Trademark. in addition to the European Union we also offer assistance with trademark registration in more than 120 countries around the world Contact us directly on: +31 - 88 130 9400. Most authorities do not check whether a trademark has already been registered when someone applies for a trademark registration. This means that the identical or similar mark can be registered again and again without the competent authorities rejecting or signaling such later applications. It is very important to carefully monitor all new possible conflicting trademark applications to be able to take action against them. Monitoring each trademark application manually is almost impossible. With Trademark Watch you benefit from our fully automated monitoring service. We will detect all conflicting later registrations and allow you to take action immediately. A European Union trademark registration is valid in the following overseas departments as well: Guadeloupe (GP), Martinique (MQ), Guyana (GF), and Réunion (RE). Based on your European Union trademark registration you will be able to act against trademark infringers in all 27member of the European Union. Our trademark attorneys will gladly answer any questions you might have. Our initial pre-registration advice including identical trademarksearch is always free of charge. A trademark is a symbol, design, word or any other device that identifies and distinguishes products and services in the marketplace. Your trademark can become your company’s most valuable asset. Consumers will identify your firm with your chosen trademark. Insufficient protection of this trademark in the European Union can have major consequences for your company. A European Trademark ensures exclusive rights to a specific brand for the covered goods and services . One can also authorize someone else to use the trademark in return for payment. To protect your business in the best way possible, you should consider registering more than one trademark. For instance, you can register your company name and specific product name or logo as trademark trademark on your company’s slogan and its logo. Our trademark attorneys will gladly advise you about all options that may be relevant for your company and its potential trademarks. A trademark application has to be filed at the European Union Intellectual Property office (EUIPO). A simple signed power of attorney is required. Foreign applicants do not need a domestic registration. The application process includes an official search for identical or similar trademarks. It takes approximately 7 months from first filing to registration. The trademark is published in the “Trademarks Bulletin” before registration. It is possible to file an opposition against the trademark registration at a court within 3 months from the date of publication. A trademark registration in the European Union is valid for 10 years and starts at the day of registration. The registration is renewable for periods of 10 years. When you apply for a an European Union Trademark registration, you have to specify the classes for which your trademark will be registered for. Classes are the products and services that will be associated with your trademark. The International Classification of Nice is the system that is in place for grouping products and services. This system uses 45 classes, 34 for products and 11 for services. The European Union Trademark only offers protection within the chosen classes at the time of registration. This allows two identical trademarks to coexist in different classes. Before filing the trademark application we will assist you in determining the correct classes for your trademark application. Not sure what classes apply to your trademark? Ask for our opinion! 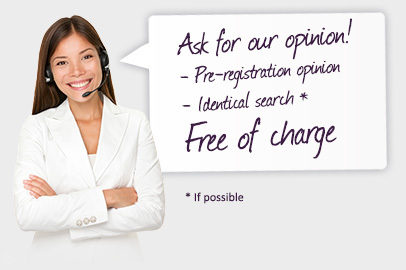 We offer pre-registration opinion and identical search. Free of charge! In general, a trademark has to be registered in each individual country where you want the trademark protection to apply. However, some regions have signed treaties to make it possible to register a trademark in multiple countries at once. The European Union has one of these treaties in place. The European Trademark applies to all countries within the European Union. European Trademarks are registered at the EUIPO. As stated before, this office will not actively check for existing trademarks when someone tries to register its European Union Trademark. Therefore, problems can occur when a third party registers a similar trademark. Always make sure you have a system in place to check for future trademark applications. The trademark attorneys at Trademarkhost will gladly help you with the monitoring of similar trademark applications. Until the 233rd of March 2016, the European Union Trademark was known as the Community Trade Mark (CTM Trademark). This trademark was first introduced in 1994 and the first applications were filed on the 1st of April 1996. The Community Trademark was administered by the Office for Harmonization in the Internal Mark (OHIM). The OHIM changed its name to the European Union Intellectual Property Office (EUIPIO) when the name of the Community Trademark changed to European Union Trademark. Third parties from any EU country can file an opposition against the registration of your trademark application if they believe that you should not obtain trademark registration in the European Union When an existing trademark in one or several European countries is causing problems an EU trademark can be converted into several national applications. This alternative excludes the countries that are causing problems with the EU trademark. This process is rather complicated, knowledge of the rules in numerous countries is required. The attorneys at Trademarkhost will advise you when applying for a trademark in a single European Country, several European countries or the European Union Trademark. Do you want to know more about our services or do you have any questions? Contact us directly on: +31 - 88 130 9400 or let us call you back. Our trademark attorneys will gladly help you with any questions you might have regarding European Trademark. Contact us directly or let us call you back.